Climbers use all sorts of different pieces of gear. Maybe you’ve heard mention of slings, runners, cordlettes, and more, and wondered what the difference is. While there are likely too many ways to use all of these to fully list, hopefully this will give you a good idea of the basic differences and how and why climbers use them. Climbing slings are also known as runners. A sling is a made of a section of strong nylon webbing sewn together in a loop. Slings also come in different widths, and they have a lot of uses in climbing. 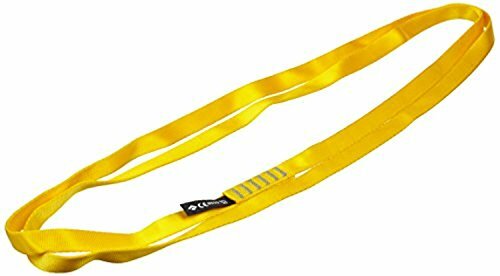 Slings and runners generally come in single and double sizes, with the single length being at least 2-3 times longer than the average quick draw. Since your quickdraw will all be a standard length, using different lengths of runners to create a variety of options for draw lengths to use together. Slings are perfect for connecting climbing anchor systems. Popular anchors will link carabiners to anchor points by using either multiple slings or a sling tied into a climbing knot to split it in to redundant connection points. 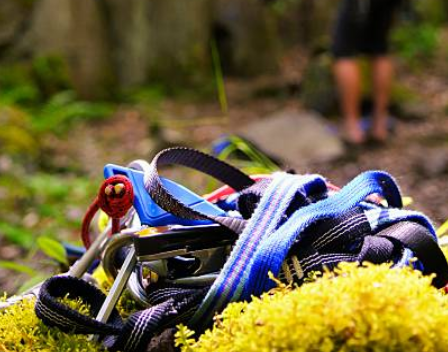 It’s quick and easy to attach all of your carabiners and climbing equipment to one place. This can be useful for the things you don’t want to store on your harness at the moment, or for storage and transporting. Slings are meant to support your weight statically, not to minimize the impact that a large fall would take on your body like a dynamic stretch climbing rope does. In times when you want to be connected either to anchors, for belaying, or any other reasons to hang out on the wall while you’re not actively climbing on a rope. As one of the most popular uses for pre-sewn slings is to create quickdraws. there are some commonly popular styles that will appeal to different uses and climbers. 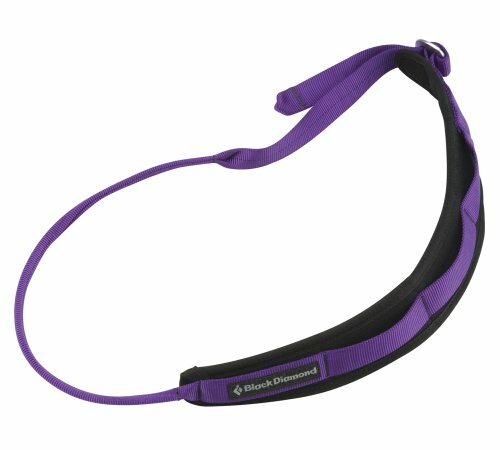 The Black Diamond Dogbone slings are solid and stable, and easy to grab because of the thick and sturdy width. There is also a liner in the loop to keep the bottom carabiner from moving positions and from wearing out the bottom loop. 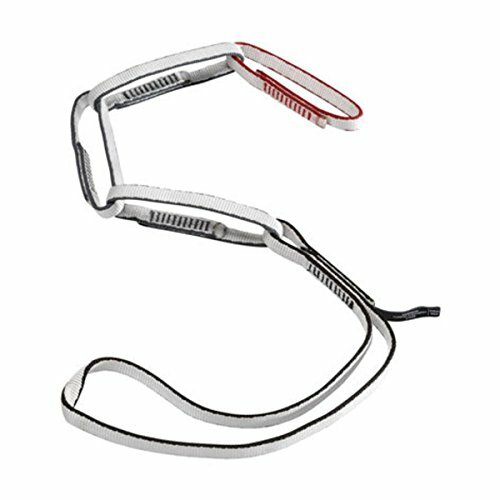 The Petzl Express Sling is slim and ergonomic, making it easy to grab and keep in the proper orientation. It is also available in three different lengths. Any time you are setting up an anchor outdoors somewhere new, you may not know what to expect the optimal length between anchor points to be. It’s good to bring along variable length slings just in case. Many climbers prefer longer slings for setting up anchors so that they have more options to double up or tie. The Black Diamond 18mm Nylon Runner is a very popular sling pre-sewn into a loop. They are available in many different colors, and in different lengths. The longest length of 240 cm (94.5 inches) is commonly used to set up multiple point anchors. 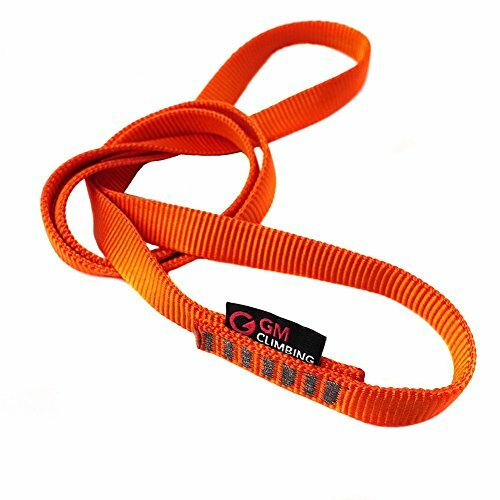 The GM Climbing 16mm Nylon Sling Runner is very thin and durable. It has a recognizable aesthetic and is available in two different colors: a bright orange color that makes it easy to spot and distinguish, and a grey-rock colored version that blends more into the rock climbing wall environment. 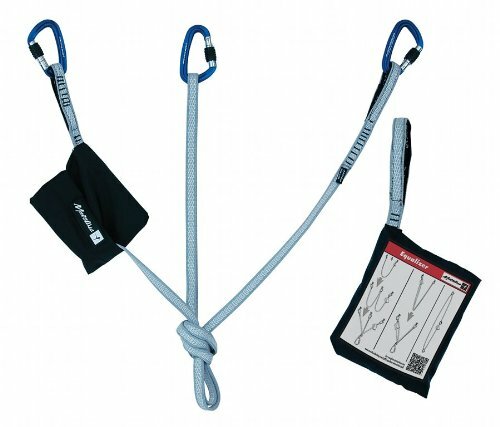 The Metolius Equalizer Sling is a very long sling that is easily looped to create two and three point anchors. 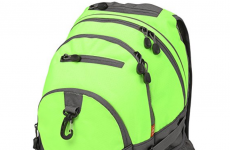 It also comes with a handy storage pocket that can be easily detached from the sling. Gear slings are a way to carry and store your gear. 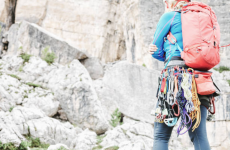 They make passing gear to your partner easier, and they can be used to store the gear that you’re not taking up with you on the climb when it’s not needed. The Black Diamond Padded Gear Sling has a comfortable padding that wicks away moisture. It has straps that are easy to adjust for a good fit. 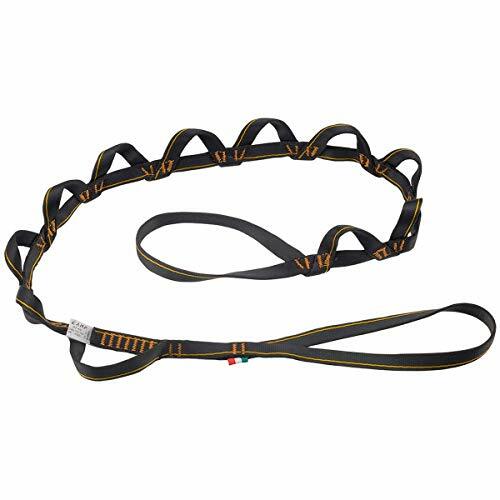 The Metolius Multi-Loop Gear Sling has multiple loops to help you organize your gear better. It has a buckle that is easy to adjust. A daisy chain has multiple loops that allow you to re-attach yourself at different lengths to an anchor point. They are safer, more convenient, and more adjustable than using slings or quickdraws at the anchor. They are also useful for attaching yourself to your jumars, and for clipping other gear pieces in use to prevent you from dropping them. Daisy chains are meant for uses that support your own body-weight. They are not designed for hauling heavy gear or to take impact of a fall. Just like all sewn slings, the strength of a daisy chain is in the stitching. It’s never a good idea to clip a single carabiner into two loops beside each other, because if the middle of the two pockets came out, the carabiner would be attached to nothing. 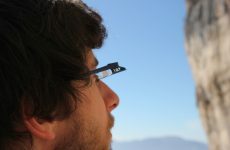 The CAMP Daisychain uses a clever twist in each pocket to prevent coming unclipped in case of a accidental loaded fall. Rip out all the pockets, and you are still clipped to the runner portion of the daisychain. A personal anchor system is similar to a daisy chain, but instead of being all one long runner stitched together, it is made up of a chain of individual loops. Each loop is a full strength loop. The Metolius Personal Anchor System is 42 inches long and has five separate full strength loops. It was designed to be a safer alternative to daisy chain systems by reducing the points of failure. 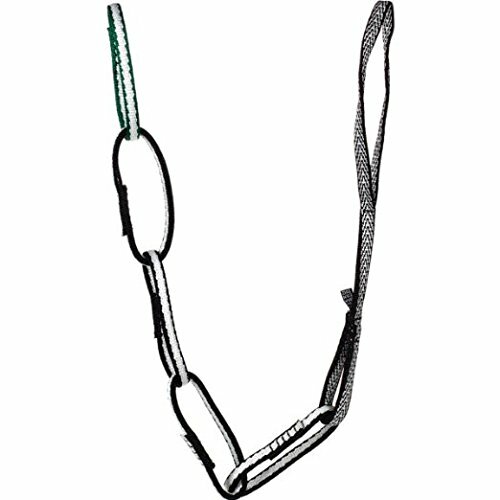 The Black Diamond Link Personal Anchor is a great personal anchoring system with 4 color coded loops rated for 22kn each. It works perfectly for anchoring yourself at the top of a route while cleaning your gear or to a belay station. The Sterling Rope Chain Reactor is popular because of it has long loops making it easier to handle connection the loops. While it is available in all black, it also comes in some great color combinations. It is great to be able to tell quickly by color which loop is the end loop. Climbing Webbing is a strong nylon fabric woven together. 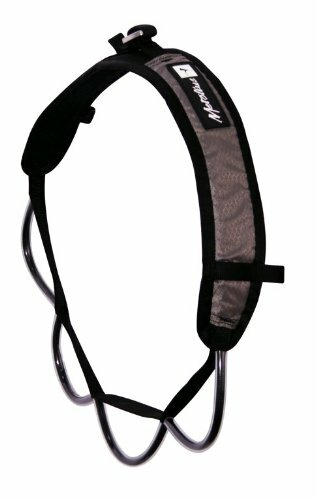 It is useful for slings and for a lot of other climbing gear. Webbing built to climbing specifications is heavier, thicker, and slicker than military spec webbing. Tubular webbing forms a tubular shape, making it stronger and easier to tie knots and have them hold better. Cord has a lot of uses in rock climbing, and can be used just like other slings can. When using a cord as a sling, it is called a cordlette. Cords are also commonly used in belay loops and anchoring systems. 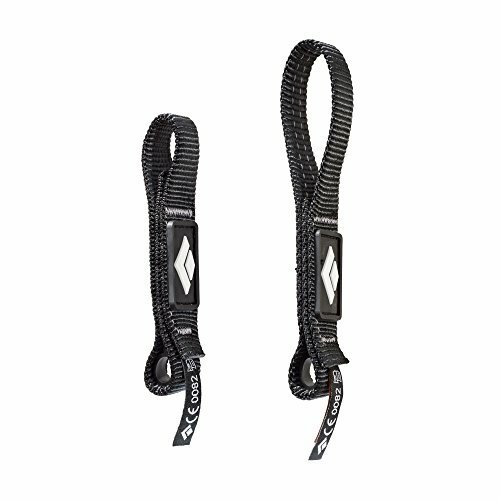 The Petzl Connect Adjust provides better adjustability than a daisy chain or other personal anchoring systems. Being more similar to a climbing rope than to a static piece of webbing or a sling, they can even withstand the impact a bit more force. It can be easily adjusted with one hand, and is a great example of the different uses for cord in climbing. We hope this has been a good intro to using webbing and cord for climbing. There are a lot of ways these pieces of gear can make things easier, safer, and more fun. What are your favorite uses for cord and webbing? Do you make your own runners or sew your own slings? Let us know in the comments.